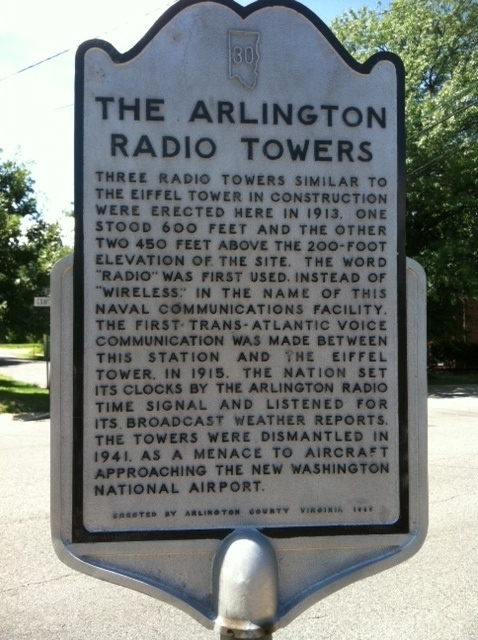 One of the coolest things about my building – other than the fact that I live here, haw haw – is that it sits on a spot once occupied by the world famous Arlington Radio Towers. There were three of them, and they were not unlike the Eiffel Tower in appearance. The tallest tower stood 600 feet tall. Click the photo to enlarge it and read the text. Thanks to Eric Mercado. A picture showing how they appeared from neighboring Arlington National Cemetery is here at DC Public Library Commons’ Flickr. I have also seen pictures showing a fourth tower under construction, such as this picture at the Library of Congress. Other pictures appear to show additional towers. Yet the marker only mentions three. You can watch a brief Pike 200 Minute video about the Towers here, on arlingtoncounty’s Youtube channel. Today, after you read the marker, you can keep going down South Courthouse, make a left on 2nd, make a right on Glebe, park at Ballston Common Mall, head to Rock Bottom Brewery, and order yourself an Arlington Radio Towers Red ale! For those of you not terribly familiar with Arlington County, it’s made up of many different urban neighborhoods, each with its own character. Arlington has a storied history of growth; it’s one of the wealthiest counties in the U.S. today and often strange things happen with its money. As a result, a few of our neighborhoods feel almost like architectural experiments to me. And if you listen to a lot of people, Rosslyn is one such experiment that has failed. Arguably more urban than its neighbor across the river, the District, I hear Rosslyn derided as a sterile collection of skyscrapers fairly often. But Rosslyn is part of why I love Arlington so much, and the pieces of its occasionally odd history charm me. Rosslyn’s planning process was once envisioned as keeping vehicle traffic and foot traffic on entirely different levels. An elaborate skywalk system was built, to include easy access to above-street-level dining and retail. Unfortunately, the plan was ultimately seen as a colossal failure as much of the planned commercial space went unfulfilled. Many of the skywalks have since been removed as Rosslyn focuses more on improving ground-level sidewalks and crosswalks instead. I think there’s only one skywalk left, in fact, although the Skywalk Cafe is still in business. More recently, new future plans for Rosslyn seemed to focus on making it the “Manhattan on the Potomac” … good luck. In the meantime, while most of the skywalks are gone, the sign of another failed Rosslyn plan remains in a quite visible location: Freedom Park. According to this article at Greater Greater Washington and this follow-up post at ARLnow, Freedom Park was built as an overpass ramp called the Loop Road Bridge. It was meant to connect travelers to the District apart from ground-level traffic, and was the first of what would have been several such ramps had the decades-old plans gone through. The user comments at GGW show a few residents recall that this overpass was never used for its original intended purpose due to inadequate construction by the contractor or contractors. Unable to support the weight of so many cars, it stood as an eyesore for about six years. (See pictures of what the ugly bridge originally looked like right here!) Eventually, the County Board had to agree it was better to let someone else use it for a more attractive purpose, and so the bridge was converted to Freedom Park in the mid-90s, with the Newseum (then located in what is now the Artisphere, another hotly contested use of County funds) using it as a great outdoor space for many of its exhibits. In a Washington Post article published on July 4, 1996 (the park’s opening day), Lan Nguyen wrote that the overpass was meant “to divert traffic around Arlington” and was abandoned due to “structural and other concerns.” ARLnow.com mentions that a legal battle occurred in 1990 following discovery of major engineering flaws and the firing of the contractor. Nguyen wrote that the Arlington County Board then decided to dedicate “portions of it” as Freedom Park “for 25 years” (emphasis my own) in 1994. Another Post article by Benjamin Forgey from April 19, 1997, covering the opening of the Newseum nearby the previous day, mentions more about that mysterious time frame: the Newseum and associated realty received permission to develop Freedom Park on the condition that it be returned to the Board after 25 years if the county decided to attempt the whole highway loop once again. 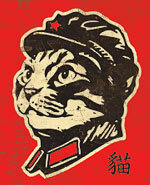 (Hi Chairman and friends, please don’t.) I’m not sure if that condition is still present now that the Newseum has moved into DC and the park has been taken over by Monday Properties, but I would assume so. I sadly never saw the park while it was part of the Newseum. At the time, the lower plaza contained pieces of the Berlin Wall while the upper displayed numerous democracy- and freedom-themed exhibits, including a journalists’ memorial. In 2008, the Newseum moved to its current location in downtown DC and took most everything notable from the park with it. 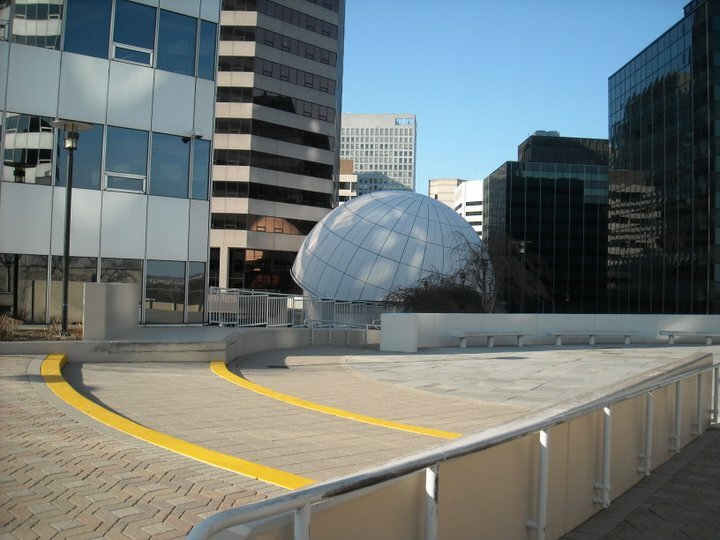 The vacated museum space is now home to the Rosslyn Spectrum Theatre, the Artisphere (called the Fartisphere by some who didn’t approve of the county spending the money on it), and the restaurant HERE. The upper and lower levels of the park, meanwhile, don’t have a lot going on but still provide a great place to eat a mid-day lunch or look out over the Rosslyn skyline. If you pull Freedom Park up on Google Maps, you can see how the park’s design fits that of an overpass and goes across Wilson Boulevard and around the towering ABC-7 building (one of the two former Gannett Towers). Rosslyn has been described as “sterile” “boring” and “bland” but it does have its charms. 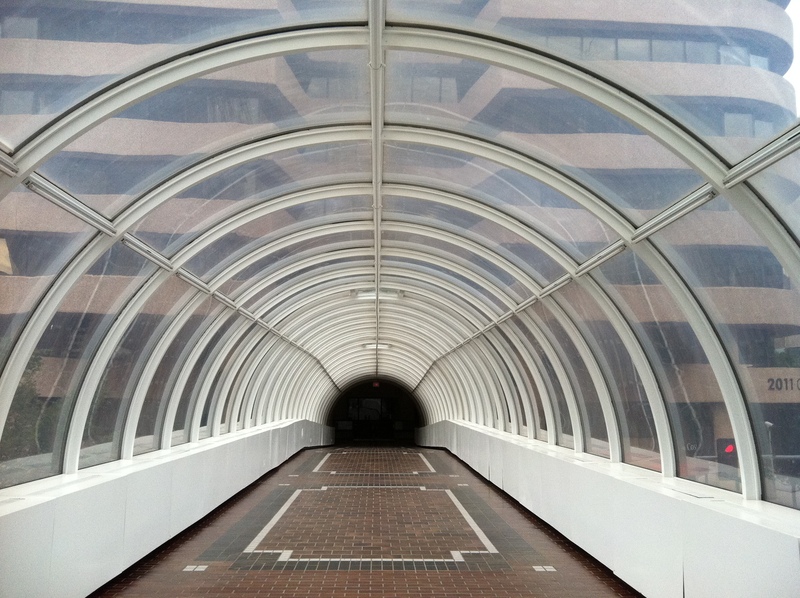 We’ll revisit Rosslyn’s many interesting corners in another post. And next up we’ll take a look at Crystal City for another example of an Arlington urban neighborhood whose unique pedestrian accommodations are also being re-examined.